I'm preparing by learning my music for both roles and doing some research for Much Ado! I've been reading the original play and loving it - I can't wait to bring Beatrice and Benedick's war of wits to the stage. Something that attracted me to NUOVA this year was the opportunity to perform a new work. Much Ado! has only received a couple small productions/workshops and I can't wait for more people to hear James Garner's fantastic score. I'm also a huge early music nerd, so I'm definitely looking forward to working with Dan Taylor on The Fairy Queen, too. Carly Naimer is a Canadian mezzo-soprano, born and raised in Toronto. Naimer grew up immersed in the performing arts, studying ballet for thirteen years, as well as directing, choreographing and starring in various musical and dance productions in high school. She attended Wilfrid Laurier University in 2016, where she studied with baritone Michael Donovan, a pupil of the legendary Dietrich Fischer-Dieskau. She is pursuing her bachelor of music in voice performance at the University of Toronto under the tutelage of soprano Elizabeth McDonald. She has sung in masterclasses with esteemed Canadian artists, including Emily D'Angelo, Wendy Nielsen, Catherine Robbin and Theodore Baerg. 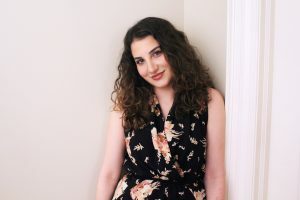 A passionate choral singer, she performs regularly with the U of T's Women's Chamber Choir and the Beth Tzedec "Shir Hadash" ensemble under conductor Ezra Burke. She made her opera debut in the summer of 2017, performing the role of Vera Boronel in Long Reach Opera’s production of Menotti’s The Consul, directed by Anne-Marie Donovan. Most recently, she sang the role of Juno in Handel's Semele with Summer Opera Lyric Theatre. She looks forward to joining Opera NUOVA this summer where she will perform the roles of Beatrice in the Canadian premiere of James Garner's Much Ado! and Mopsa in The Fairy Queen under the baton of countertenor Daniel Taylor.